There are many unique features that will make your stay memorable. Join the butterflies and hummingbirds as you meander through a garden of flowers and herbs. Catch some quiet time on the garden bench located below the cascading waterfall. Enjoy walks or jogs along the quiet country road leading to Black Rock State Park, and to peaceful Wolffork Valley. Take an evening stroll to the nearby pavilion on Black Rock Lake, and catch a spectacular display of planets and stars in the clear, dark sky. Search for beautiful and endangered wildflowers with your camera along the roads and trails in nearby Black Rock State Park. Sylvan Falls Mill B&B is a premier North Georgia Attraction that attracts visitors from around the world. We are located between Dillard and Clayton Georgia just a short drive north of Talullah Falls and a wee bit west of the Chattooga River. Each morning, guests are treated to a full, scrumptious breakfast served on the screened porch that overlooks the waterfall. The innkeepers share their culinary skills with guests each morning through the home-baked breads, special breakfast dishes, fresh fruits and a variety of treats and beverages offered. Whole grains and organically grown ingredients are incorporated in most recipes. Mike and Linda take pride in serving foods grown and produced in Rabun County. Ask them about where to get the best in local produce, meats and dairy. Simply Home Grown, a community farmer's market features our mill products. The inn?s location enables guests to pursue a variety of shopping, dining and recreational activities. 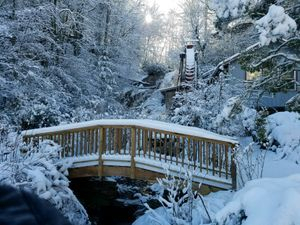 Located near three state parks, four mountain lakes, many area waterfalls and a national forest, the inn offers guests easy access to pursue hiking, rafting, fishing, biking, horseback riding and snow-tubing. 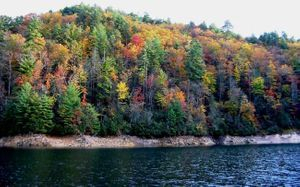 The North Georgia mountains have several beautiful golf courses in picturesque mountain settings, Also located close by are flea markets, antique shops, art galleries, an auction house, farmers markets, and a variety of restaurants specializing in a variety of gourmet and regional cuisine. Our eco-friendly approach to living has been incorporated into our amenities and services. Along with recycling and utilizing Green cleaning products we incorporate local, regional, organic and sustainable ingredients in our breakfasts. Our aim is to minimize our footprint while maximizing the enjoyment of our natural setting. We also have purchased credits to offset the Carbon footprint of our guests. For our guests that prefer to stay on property once they arrive, we offer catered dinners and gourmet gift baskets. 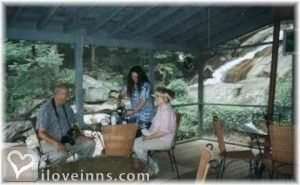 Enjoy a quiet meal on the porch or at the foot of the falls. Please make your plans when you book your reservation. Have a sweet tooth? Ask us about our own make dark chocolates. We also offer a variety of fresh pastries for you to take home with you. Our scones, muffins and some breads may be ordered and we will prepare them fresh for your departure. Looking for adventure ? Allow us to assist you planning your outings while in the area. 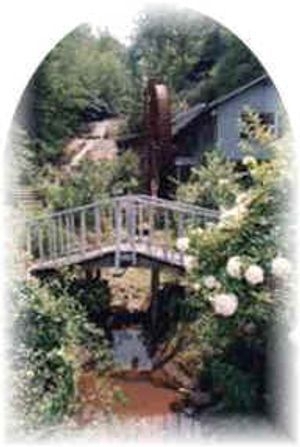 Rent the Inn for your retreat, reunion, or group get away. We can cater a package to fit your needs.